The leaf bases found on the trunk called “boots” provide a place for epiphytes like the native golden polypody fern to grow. 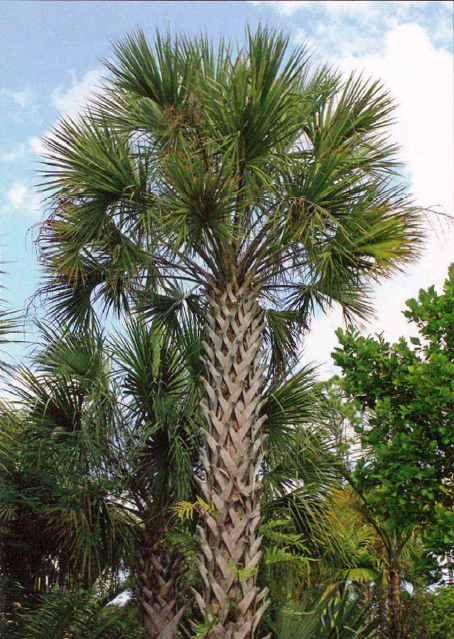 Also known as the sabal palmetto or cabbage palmetto, this easily recognizable tree is native to the region and an important resource to other plants and animals. This ecologically important palm provides food for bears and deer all over Florida and its flowers entice important pollinators like birds and butterflies locally. These palms can be identified by their large palmate or fan-shaped fronds, as well as by the characteristic cross-thatching leaf bases found on the trunk. One of the most cold tolerant palm trees, this palm is native to Florida but is known for withstanding temperatures down to 5 degrees Fahrenheit. Even more so, this palm is known for its fruit, which is widely used in alternative medicine to alleviate reproductive and urinary ailments. Not only is this palm economically important but also has great ecological importance to Florida’s wildlife. The Florida grasshopper sparrow and wild turkey utilize this tree for nesting, while the berries are a food source to birds, mammals, and gopher tortoises. The saw palmetto looks similar to the cabbage palm, but can be distinguished by its horizontal growth form where it often looks more like a shrub than a tree. The everglades palm or paurotis palm is another fan palm native to our region. This water-loving tree is one of the few that can tolerate standing pools of water and even slightly brackish water. This palm often forms clusters of tall slender trunks that can reach up to 40 feet high, making it an attractive landscaping plant – but be careful, the petiole (leaf stalk) is covered with menacing spines! This quintessential palm is most likely the favorite palm of all tropical vacationers. The royal palm is native to south Florida and is often standing tall and regal along roadsides or at beach resorts. In addition to aesthetics, bees, bats, and birds also take advantage of this tree for pollination and nutrition. Growing to heights of 60-80 feet, this palm is easily distinguished from other palms on this list not only by its height, but also by its fronds. In botanical terms, the fronds are pinnate, which means the leaves grow evenly along a single axis, somewhat resembling a feather. By law, the city of Sanibel requires 75% of all landscaping plants to be native and 25% may be non-native species. The coconut palm is considered a neutral species and is not counted as native or non-native. The only species on our list that is an exotic in Florida is perhaps the most functional of the bunch. Having a worldwide distribution within the tropics, we aren’t sure where exactly the coconut is from, but fossil records suggest the Indo-Pacific may be where it originated. The coconut palm has gained its large distribution not only by human transport, but also by dispersing coconuts in the ocean, allowing them to float for miles before germinating. The coconut itself is an energy-rich food packed with iron and potassium and even the husk can be turned into new products or used as a horticultural media. If you are interested in finding out more information on palm trees or native vegetation to plant in your yard, check out the Sanibel-Captiva Conservation Foundation (SCCF). They have a native plant nursery and can recommend plants for your own garden to attract birds, butterflies, or just to give your home a beautiful natural landscape. If you want to browse through some beautiful scientific drawings of palms, take a few minutes to flip through this book next time you're at your local bookstore.